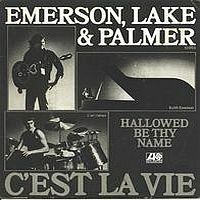 ELP's C'est la Vie/Hallwed Be Thy Name was a single released off the Works Volume 1 album in 1977. Both songs are by Greg Lake and are the usual fare one might expect from Lake on an Emerson, Lake & Palmer album. C'est la Vie never really impressed me a whole lot. It's a decent song in the vein of a love ballad, but pales in comparison to other more notable songs in the ELP discography. But I suppose from the other material on Works Volume 1, of which there isn't a whole lot to pick from, this was probably the most radio friendly song that could be tapped for a single. The B-side isn't really memorable either. The lyrics seem messy and I'm not certain what the message is really aiming at. I'll leave that up to the ELP experts to translate. Both songs were co-written with Sinfield. I wouldn't say this is poor material. It's more like the usual filler one might find on an ELP album. Definitely for fans and collectors only, particularly if you already own Works Volume 1. Two stars.